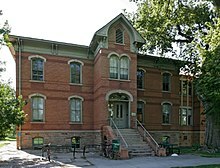 Colorado State University Historic Spruce Hall. Larimer County is one of the 64 counties in the U.S. state of Colorado. As of the 2010 census, the population was 299,630. The county seat and most populous city is Fort Collins. The county was named for William Larimer, Jr., the founder of Denver. Larimer County was founded in 1861. The county has a total area of 2,634 square miles (6,820 km2). It is at the northern end of the Front Range, at the edge of the Colorado Eastern Plains along the border with Wyoming. ↑ "State & County QuickFacts". United States Census Bureau. Archived from the original on July 13, 2011. Retrieved June 8, 2014. ↑ Gannett, Henry (1905). The Origin of Certain Place Names in the United States. U.S. Government Printing Office. p. 181. Wikimedia Commons has media related to Larimer County, Colorado. This page was last changed on 22 September 2018, at 18:21.